Sony PlayStation Game published 20 years ago by Hasbro Interactive, Inc.
Missile Command © 1999 Hasbro Interactive, Incorporated. Classic - The original game, from 1980, with modernized graphics. Ultimate - The core game in this remake. You travel to hot zones around the world and fight off waves of attacks, as in the original game. Successfully defend an entire region, and you will be launched into near-Earth space to attack and destroy the mothership from which the most recent attacks were launched. Missile Command for Sony PlayStation was released on November 26, 1999 in North America. 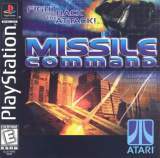 [EU] "Missile Command [Model SLES-02245]"
Sony PlayStation Network [PSOne Classics] [US] (oct.27, 2010) "Missile Command"